As research into Irritable Bowel Syndrome (IBS) and parasitic infections have become more comprehensive, our understanding of the gut is changing in profound ways. For example, we were previously unaware of the potential chronic gastrointestinal complications that can develop from a giardia infection. A recent study documented the persistent health effects that can result post-infection. Even after the removal protozoan Giardia (also known as Giardia duodenalis, Giardia lamblia or Giardia intestinalis) from the body, the majority of patients had long-term gastrointestinal disorders. This article will briefly discuss the possible outcome of ongoing IBS symptoms after a Giardia infection. Giardia is spread when hands or water become contaminated with the feces of infected animals or persons. This happens most frequently from poor sanitary conditions or untreated water. Giardia is diagnosed by examining the feces under a microscope or through a PCR test in a pathology lab. Giardia can be spread from a person as long as the organism is present, even if they do not have symptoms. Antibiotic treatment generally stops the symptoms and makes a person non-infectious within a few days. Irritable Bowel Syndrome is diagnosed in patients who have long term disorder of the gastrointestinal tract. It is a collection of symptoms such as bloating, constipation, diarrhea, and pain in the abdomen. It may or may not be in relation to food digested, and can occur in bouts. IBS is a common disorder that affects 1 in 10 Americans, according to the Internal Foundation of Functional Gastrointestinal Disorders. Though painful and uncomfortable, IBS does not damage digestive tissue or increase your likelihood to develop colon cancer, unlike Irritable Bowel Disease. If you believe you have IBS the possibility of Celiac Disease should be ruled out. It is not uncommon of those with celiac disease to be wrongly diagnosed with IBS. A recent study, “Development of functional gastrointestinal disorders after Giardia lamblia infection,” sheds emergent knowledge on the correlation between IBS and Giardia. The article was published in 2009 by the journal BMC Gastroenterology. 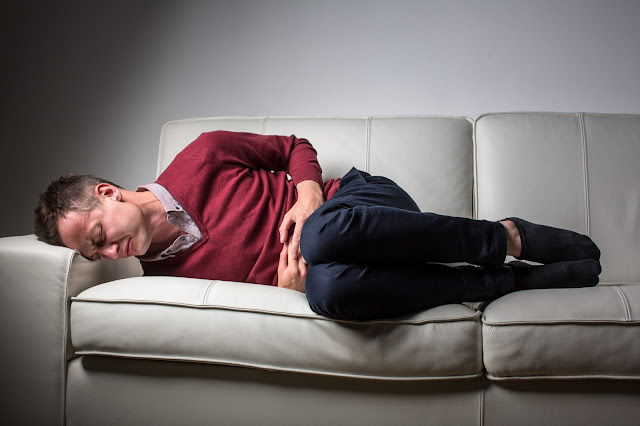 It has been known that functional gastrointestinal disorders can develop after acute gastroenteritis (inflammation of the GI tract as a consequence of a virus or a bacterial infection in the intestine or stomach). Researchers are beginning to find that on-going abdominal symptoms can also be a reaction of a Giardia infection. The study interviewed and questioned 82 patients with “persisting abdominal symptoms elicited by the Giardia infection. All had been evaluated to exclude other causes.” All had been declared Giardia free for at least six months prior to the study. They found that 80.5% of patients had symptoms, “consistent with irritable bowel syndrome (IBS) and 17 (24.3%) patients had functional dyspepsia (FD) according to Rome II criteria. […] Bloating, diarrhoea and abdominal pain were reported to be most severe. Symptoms exacerbation related to specific foods were reported by 45 (57.7%) patients and to physical or mental stress by 34 (44.7%) patients.” The researchers concluded that an acute Giardia infection may cause functional gastrointestinal diseases, with similar food and stress related symptoms of functional gastrointestinal diseases. The cause of chronic symptoms similar to IBS and gastrointestinal diseases after a giardia infection is unknown. Severity and duration of the infection appear to have an impact if a chronic GI disorder develops. Additional research is needed to understand the long-term impact of a giardia infection and the causes of IBS and gastrointestinal diseases. This research is a mighty step in the right direction to help researchers and the public develop a greater understanding of the complexity of the human gastrointestinal biome of the GI tract. It can also potentially help millions who suffer from IBS and gastrointestinal disorders. Kay’s Naturals hopes to help to improve health and wellness by making accessible scholarly research. We also provide healthy, low-sugar, gluten-free, high-protein snacks and cereals! Learn more about Kay’s Naturals here.